With photo-eye activation, the V-Stack36 neatly stacks up to 22 inches of folded documents. The infeed features a six-ball-roller deck and two guide wheels to ensure forms enter the stacker smoothly, and an LED lamp which alerts operators when the stacker is near full capacity. 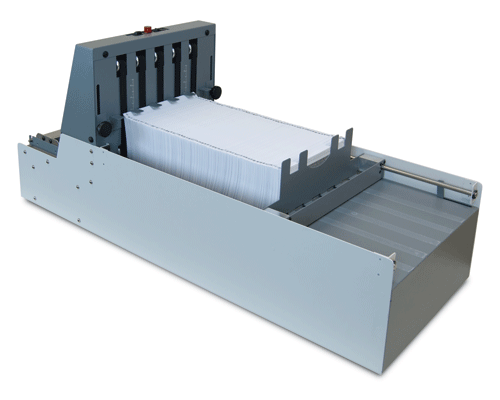 Its vertical paper stop adjusts to accommodate document sizes and fold types up to 7” high by 12" wide. An interlock is available for FD 38X folders and FD 2054, FD 2096 and 2200 Series pressure sealers, which automatically stops the stacker and the source machine when the stacker is at full capacity.